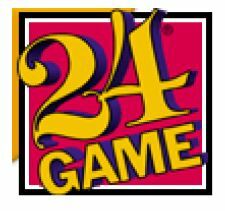 It’s time to register your team for the 2017 Regional 24 Challenge! Please note the registration deadline of Friday, April 7. Interested in having more than one team represent your school? If space allows, a second-team registration will be offered following the April 7 registration deadline. Please register your school team by April 7 using the google form by clicking here. V2CTM will be the host for the 2017 Virginia Council of Teachers of Mathematics conference to be held on March 10 and 11 at James Madison University. For more information, click here. 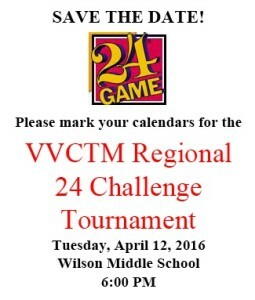 V2CTM will again sponsor the Regional 24 Challenge Tournament this coming April 20 at at Wilson Middle School in Fishersville. At the 24 Challenge Tournament, the top four mathletes from each elementary school will compete against the best and brightest from school divisions throughout the Shenandoah Valley. The Regional 24 Contest was held on April 12 at Wilson Middle School. This year, there were almost 60 players representing 13 elementary schools from Augusta County, Rockingham County, and Greene County. Congratulations to all those who participated! Special thanks to John Stevens for being the MC for the contest and to Laurie Biser for coordinating it.